Q. What was the trigger? V: In 1998 I was six and sitting in the back seat of my mother’s Jaguar Mark 2. Mum would drive around roundabouts for fun so I could slide across the leather backseat – even when wearing a seatbelt. The Mark 2 had a 3.8 Litre engine producing 220 bhp that moved the car from 0-60 mph in 8.5 seconds and to a top speed of 125 mph. With enough room for five adults the Mark 2 gained a reputation as a capable car with London’s notorious gangsters and criminals as a getaway car, while the police used the Mark 2 to patrol British motorways and chase gangsters and criminals. It must have been a dead heat. V: I loved the Mark 2 but for me most English cars were too polite and quiet. I felt I was born in the wrong country. I should have been born in the states. Victor is an avid movie buff and for him real words were spoken by loud American actors in fast cars with no idea how to spell or think polite or quiet. He’d seen real cars in American movies – his dye was cast and his plot set, the part for him to play was driving big American cars like the Yanks in movies he loved watching, again, and again, and again… Victor would one day work on a variety of famous high-profile cars including the 1960s Batmobile that was used in the movie, Fast & Furious cars (off-set), and a 50s Pink Cadillac driven by Elvis Impersonator Ian Coulson to name just a few. Victor had to find his way on a winding road and start driving in hot pursuit of his dreams. V: Like most children I was under the spell of cinema. However for me the best leading stars were high-performance cars that featured in ground-breaking American cult, crime, thriller, and road movies. The iconic ’68 Ford Mustang GT driven by Steve McQueen in ‘Bullitt’ (1968 Film). The 55′ Chevy in ‘Two-Lane Blacktop’ (1971 film). Incidentally the same 55′ Chevy appeared in ‘American Graffit’ (1973 film). The white 1970(1) Dodge Challenger R/T 440 Magnum Pistol Grip in ‘Vanishing Point’ (1971(72?) film). John Carpenter’s horror classic with the possessed ’58 Red Plymouth Fury named Christine in ‘Christine’ (1983 film). The customized 1971 Lincoln Continental Mark III in ‘The Car’ (1977 film). ‘Gone in 60 Seconds’ (1974 film) features a ’73 Ford Mustang ‘Eleanor’. And there was the ’74 Dodge Monaco in the huge hit movie starring John Belushi and Dan Aykroyd in ‘The Blues Brothers’ (1980 Film). Q. Tell me about the angry duck? V: I owned a ’69 Chevy Nova used in some night scenes and re-shoots of ‘Death Proof’ (2007 Film) directed by Quentin Tarantino and starring Kurt Russell. The ’69 Chevy Nova has an angry duck on the bonnet. The angry duck was also used in ‘Convoy’ (Film 1980) starring Kris Kristofferson. Q. What is Wild & Sons? V: Wild & Sons builds and services classic cars, high-performance Hot Rods, Rat Rods, Muscle Cars, bikes, supplies car parts, and performance parts. We are based in Hammersmith. Our work takes us across the UK and abroad. Q. Can we go back to the start. Childhood? V: My family moved around a lot when I was young. I’m from Chichester but lived in Dorset, Brighton, all sorts. I always had a love of music and guitars especially. By chance I was friends with the children of Gary Moore, the singer, songwriter, and virtuoso rock and blues guitarist most known for Thin Lizzy. He taught me the basics of guitar and I took it from there. I love blues, rock, funk, country and rockabilly. I studied music here in Hammersmith. Playing the right song and guitar puts you in a better place. I have Gibsons, Fenders, and a Greco. Q. And the seque from music to cars? V: I was in a Punk band and playing sessions but the music industry is tough unless you are well-connected. My mother, Anne, always told me to have a backup plan. I was equally interested in cars so I went to Kingston College where I obtained a diploma in Motor Vehicle Technology and engineering science. My father died when I was one month into my diploma. He was 49. That made me think. My partner Emma and I have twins and parenthood requires a steady income. We are both into cars and design and Wild & Sons was born. Emma has a strong passion for Vintage Victorian style and makeup. She has a stuffed Tarantula in our bedroom and has original Victorian prints of cadavers. Emma and I have a similar sense of humour. Black humour. We love horror movies, tatoos, the whole Kustom Kulture fashion and style scene. Wild & Sons is an exciting venture we both enjoy, and the kids love it. My son Max helps me out sometimes with tools. I taught him how to do an oil change. He gets so messy. He likes unscrewing oil filters and that sort of stuff, and screwing them on. Clara likes cars as well, but she doesn’t like getting dirty or anything. She likes to sit in the car. Q. What was your first American car? V: In 2011 when I was 19 I bought my first American car, an ’87 Chevy Camaro Iroc Z convertible. It had the best registration plate ‘D1IROC’. It cost me £500. My current car is a 1964 Pontiac Grand Prix 6.4 litre V8 given to me by a customer. I sold him a ’53 Plymouth. He’s got quite a collection of American cars in his lockup space which was full and the Pontiac was parked on the street. The council took away his on-street parking. He didn’t want to sell the Pontiac or give it away to someone he didn’t know as cars can simply disappear. He gave it to me as he knew I’d look after it. Q. What’s a Rat Rod? V: A Rat Rod is like a Hot Rod but more dangerous. A Rat Rod is all rust looking and usually not as luxurious as Hot Rods. You make a Rat Rod look dirty. You may use a rusty shell which is still solid. V: We are building two Rat Rods for advertising purposes, and detailing a Rat Rod themed bicycle. The Pontiac is booked for one upcoming film in pre-production. One film is ‘The Parallax Organisation’. I’m building a dragster for a major feature film. The Dragster will be the main car in the film. They don’t want a car that looks like a factory car so the whole car will be customised. Q. You do stunt driving? V: I like fooling around with cars and pushing them to the limits but it’s a full-time job and I actually prefer doing what I do. And I’ve got kids and I help look after my mum who is ill so no stunt driving for me. Q. What is the difference between UK Classics and American classics? V: In the UK pre-60s cars are MOT and Tax exempt. An american car is about same price as a classic english car in the UK. It’s straightforward getting parts for American classic cars and importing them into the UK. Driving on the left of the car may take getting used to at first. Q. So what is the difference in cost, say a Mustang versus an MG? V: A popular classic car in the UK is the old MGs, they cost about £4,500 while a 1965 Mustang Notchback is going to cost you a bit more, around £10,000. The cost of running a Mustang is about the same price as an MG, servicing and parts are about the same. V: If it’s pre-86 it’s 5% of the vehicles value plus shipping. 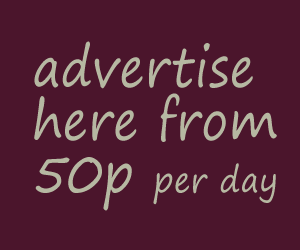 Shipping is anywhere from £1,500 to £2,000. If the car is after 1986/87 it’s 30% duty on imports. ‘We get our cars from LA, New York or Texas. That’s where the docks are for easy shipment. Q. What should a classic car owner expect? V: You can’t expect old cars to be like a modern car. Some see imperfections as part of the charm. Q. What about the popular iconic Mustang? V: With Mustangs, if you’ve got enough money you can build a Mustang from a chassis up. They still make the bodies and the chassis. They make all the parts. The thing I always say to people when it comes to American cars, the more popular the car was, the more parts will be readibly available. Even if the car was the most unpopular car in the country you’ll be able to get the servicing parts, the mechanicals, and electricals, and even some sheet metal as well. If a car is really popular you can get the chassis, all brand new body, and you can even get some fiberglass parts. V: You can get good deals with people like Adrian Flux. You may have to have a main car and have a classic car as a secondary car. It also depends on how original the drive tran is. If you have changed the gear box, rear axel, the engine, then insurance gets more expensive. The more original the cheaper insurance is. Q. Can you recommend a car club? V: I’m a member of the The American Auto Club UK. http://www.american-auto-club.co.uk/ They have meetings every month across the UK. Q. Tell me about your Summer Car and Bike Shows? 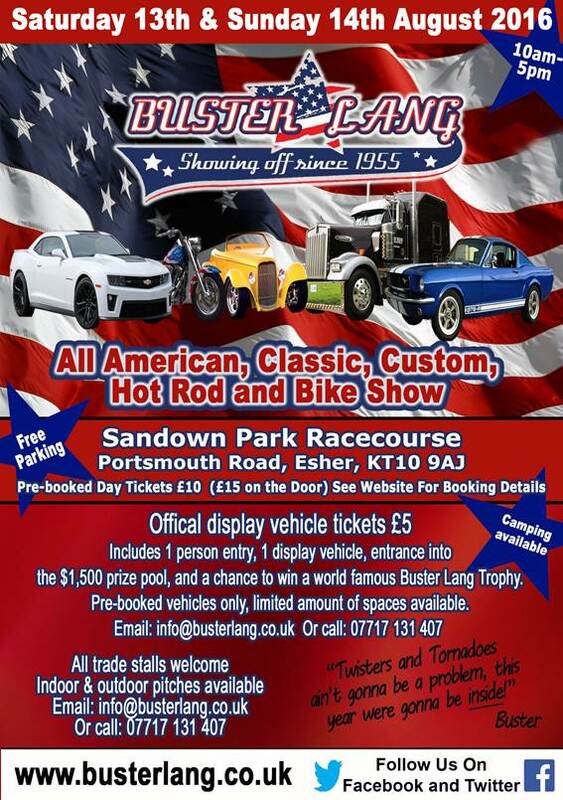 V: You’ve got the biggest meet and show in the UK called Buster Lang at Sandown Park Racecourse 13th and 14th August. There will be American Classics, Custom, Hot Rod, and Bikes. And you have Classic American Car Day at Brooklands Museum on September the 4th.